Posted on Tue, Mar 13, 2012 : 1:05 p.m.
An analysis of test-score data reveals Michigan charter schools are performing along the same achievement lines as traditional public schools, according to a report by Bridge Magazine. The article, republished Tuesday on MLive.com, said an average of 84.8 percent, 91.8 percent and 48.2 percent, respectively, of fourth-grade students at traditional public schools met or exceeded standards in reading, math and writing tests. Charter school students scored 76.8 percent, 87.6 percent and 37.7 percent, respectively, on the same tests. Similar scores were reported for eighth-grade reading, math and science tests. The Bridge Magazine article said the “charter experiment” started in 1993. Now Michigan’s 255 public school academies educate nearly 120,000 students, at an average of 470 students per school. Several education experts told Bridge they expected the impact of charter schools to be greater after two decades and significant growth. One stated charters appear to be best serving poor minorities and other low-achieving students. Gov. Rick Snyder and the Michigan Legislature passed a reform package at the end of last year lifting the cap on the number of public school academies. The cap will be eliminated in 2015. Some experts told Bridge the charter school system is not solving the problems with public education in Michigan, but rather has left the state with two failing systems instead of one. Read the full Bridge Magazine report here. Thu, Mar 15, 2012 : 4:47 p.m.
Charter schools are &quot;no better&quot; but they cost far less so public schools who get way more dollars should be way &quot;more better&quot;. How come they're not? Could it be that they don't have to be, or are not expected to be, or not motivated to be, or don't care to be, or what??? It's not money, I'm sure or folks would be willing to give charter schools more money so they could improve. Thu, Mar 15, 2012 : 1:54 a.m.
As we now know about the MEAP, 30% considered &quot;passing&quot; for some grades and subjects, I am expecting 84.8% to be not a raw score or average actual score, but students meeting sometimes 30% &quot;criteria&quot;. These folks are worse than corporate CEOs for making &quot;carefully-worded&quot; statements. Thu, Mar 15, 2012 : 1:48 a.m. I recall news articles in +/- 2007 with data showing that charters in much of Michigan actually performed WORSE academically than public schools. So is this a real improvement, or a result based upon the re-engineered tests and score rankings implemented since then? Wed, Mar 14, 2012 : 11:23 a.m.
&quot;...an average of 84.8 percent, 91.8 percent and 48.2 percent, respectively, of fourth-grade students at traditional public schools met or exceeded standards in reading, math and writing tests. &quot; According to the m-live article, these are &quot;across the state averages&quot; Is it just me, or does anyone else think these numbers seem high for a &quot;state average&quot; ? Wed, Mar 14, 2012 : 3:29 a.m.
Mon, Mar 19, 2012 : 3:58 a.m.
And how well would these children, neglected by public schools, might have tested had they been &quot;forced&quot; to remain in the public domain? You don't know and I see no &quot;significant&quot; test score difference in scores to condemn charter schools. There are public schools with lower scores, do you advocate shutting them down too? Wed, Mar 14, 2012 : 2:56 a.m. So, charter schools are essentially businesses. They draw students out of the public school system, which then close and consolidate in response to their declining enrollment. What happens when the charter schools, which have absolutely no obligation to conduct business, decide that they can no longer operate profitably and close their doors? Once the local public school districts have been decimated, and charters decide to take their ball and go home, then what? So Charter school focus on college prep and not passing standardized tests yet still post similar numbers to public school who focus on standardized tests. I would say that's a win for the charter schools. Wed, Mar 14, 2012 : 12:46 a.m. This comment takes &quot;spin&quot; to a whole new level. LOL. Tue, Mar 13, 2012 : 10:18 p.m. Poll question: Do you agree with experts that the influx of charter schools has left Michigan with two struggling public education systems? yes or no? How about, do you agree that some experts believe that the influx of charter schools has left Michigan with two struggling public education systems? yes or no? Makes just as much sense! Tue, Mar 13, 2012 : 8:54 p.m.
Our kids went to a charter school up until 5th grade. The academics were not real good for them. The people who liked it were the ones whose kids were very bright. They got a lot of extra attention and were pretty much catered too. The other ones who liked it were the ones whose kids had social or behavior problems. The school did a good job with inclusiveness and preventing bullying. But some of the classes were dominated by some of the behavior problems. Perhaps that is true anywhere. I am not sure. I see we're back on the &quot;Bridge&quot; again. Is this because of the Bridge/A2.com relations with &quot;MLive&quot;? Or being run by former democratic Regent Power with leadership including former democratic legislative and campaign staffer? The Author of this Bridge story: <a href="http://grossepointetoday.com/news/comment/002291-theres-reason-its-called-dutyeven-local-elections-are-serious" rel='nofollow'>http://grossepointetoday.com/news/comment/002291-theres-reason-its-called-dutyeven-local-elections-are-serious</a> Admits signing a Synder recall (and later laments) in an op/ed. Is there some arrangement between Bridge and A2.com? If so, would you mind stating it? Tue, Mar 13, 2012 : 7:21 p.m. This is a clearly biased article because it lumps all charter schools together as if they are a single institution in the way that state run schools are. Charter schools undoubtedly have a range of successes and failures. In the charter school system the good ones should grow and thrive while the poor schools should fail and close. Public schools do not reward outlying success or punish outlying failure. And that is bad for kids. Charter schools also exist for additional reasons than public schools. Some provide programs parents and students value. Some provide values reinforcement that state run schools actively attack and undermine. Some take on certain clategories of students the public schools do not serve well (even though state run schools must serve everyone does not mean they serve everyone well). So just taking a lump average of reading and math really doesn't cut it. If parents value charter schools and want more of it, I am all for expanding the program even if it means closing state run schools. Go for it! Tue, Mar 13, 2012 : 8:49 p.m. The traditional public schools are also all lumped together...DPS, AAPS, YPS, etc. Both types are being looked at in the same way so I think the comparison is valid. There are some charter schools that are good at certain things. But, one could say the same about traditional public schools like Clemente, Stone, and Community. &quot;Close state run schools&quot; -- and the implications for those that choose not to participate in charter schools is .... what exactly ? Tue, Mar 13, 2012 : 6:15 p.m.
From the article: &quot;U-M expert: Charter effects largest on poor minorities Susan Dynarski, a University of Michigan professor currently at work on a multi-year study of Michigan charter results, worked on a similar study in Massachusetts for the Boston Foundation. There, she said, in urban areas, among poorer and non-white students, charter-school lottery winners showed "large and positive" effects, as compared to the lottery losers who stayed in traditional schools. And the good effects improved over time, to the point that "three years of going to a charter erases the black-white (achievement) gap." &quot; ...and we are willing to give that up? How progressive, I mean liberal can we get? Looks like there is an answer for the achievment gap staring us in the face but for some reason, we reject it. Why could that be? Wed, Mar 14, 2012 : 1:55 a.m. I would expect that charter schools would do poorly in an area like Ann Arbor. The schools here seem to at least churn out decent test scores. I don't choose to send my kids to one, but I don't begrudge someone else the opportunity. Quite frankly, I think they often do it because their kids can't hack it in the public schools for whatever reason, but if there is a nut for that bolt, so be it. Tue, Mar 13, 2012 : 7:38 p.m. I see. I suppose that's why when the MI legislature expanded charters, they decided to focus on urban areas...oh wait, they didn't do anything like that! They lifted the caps completely; charters are opening everywhere, from Canton to Ann Arbor - hardly &quot;urban&quot; areas. And as the second part of that quote you posted above stated, &quot;Outside the urban areas, where school populations are generally better-off economically, results dropped to zero or even negative, Dynarski said.&quot; I would be fine with research-based changes to the public school system and it is likely that charter schools are an important part of the solution in poorly performing districts. But our legislature doesn't care about such distinctions or research-based policy. Tue, Mar 13, 2012 : 5:59 p.m. Assuming the accuracy of the numbers, something that should be kept in mind is that charter schools are achieving at least comparable (and I would say far better) educational results to &quot;traditional&quot; public schools using substantially lower per-pupil funding and without the type of capital improvements bonding authority available to school districts. The difference between per-pupil funding in the Ann Arbor public schools and at a nearby charter school can be as much as $3,000 or more! This means, on an individual student basis, charter schools provide at least the same level of learning, but at a substantially a lower cost compared to &quot;traditional&quot; public schools. This is a model we should embrace, not deride. Tue, Mar 13, 2012 : 8:45 p.m.
My guess is that many charters get money from other sources. I know one Washtenaw county charter is housed in a county building and gets a lot of help with utilities, etc. I suspect that others like Central Academy may have donors in their communities. Tue, Mar 13, 2012 : 6:35 p.m.
Charter schools receive the state mandated minimum per-pupil allowance, plus about $300 extra per pupil for the authorizer's fee. So no - charters don't get &quot;substantially less&quot; money than traditional public school districts do. They get slightly more than most public school districts in the state do. Before you argue about this, AAPS, which DOES get substantially MORE than the minimum per-pupil allowance, is one of about 50 &quot;hold-harmless districts&quot; and has gotten much more than the state minimum since 1994. It is also the regular beneficiary of the millage-happy voters in Ann Arbor, who will vote up anything that looks like it could increase property values. There are plenty of traditional public school districts that get only the state minimum. Because of the extra lard that charters get for their authorizers, most traditional public school districts in Michigan actually get LESS PER PUPIL than the charters do. Tue, Mar 13, 2012 : 5:47 p.m. I am &quot;Pro-Choice&quot; if it work for women's rights it also works for education! Wed, Mar 14, 2012 : 4:13 a.m.
@xmo The problem with your argument is when people choose to send their kids to charter schools, they're harming and further dismantling the public school system. This creates a less favorable situation for those students who remain in public schools. As time goes on, our education system in Michigan is becoming more and more inequitable. When you look at research supporting excellent school systems (like those in Finland) you'll find that ALL students are provided an equal opportunity to receive a top-notch education. Private and charter schools don't exist in Finland, and yet they have one of the best education systems in the world. Instead of creating a system of &quot;choice&quot;, the citizens of Michigan need to focus on providing an excellent education for all. Everyone will reap the benefits of a more educated Michigan (i.e. lower crime rate, less poverty, etc). 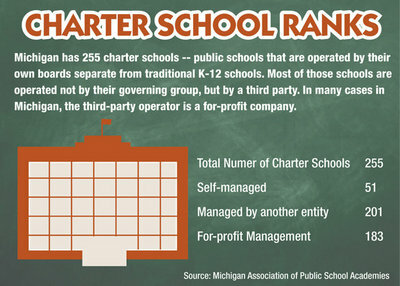 Besides, the State of Michigan ALREADY has a disproportionate number of charter schools. At least 25% of all the charter schools in the entire nation are located in Michigan. I'd say we've already caused our public school system to deteriorate enough. Charter schools are not the answer. So unions are NOT the problem after all?! Stop bashing unions and teachers and address the real problem: An adequate and reliable funding source for all schools so that administrators can stop spending their time balancing the budget and instead use their energy improving instruction for students. My how we jump to conclusions to defend our turf. Union influence has replaced concern for the student with enrichment of the employees. History shows kids are less educated at much greater expense. Good job unions. Tue, Mar 13, 2012 : 5:45 p.m.
Tue, Mar 13, 2012 : 5:44 p.m. If the numbers you've posted in your second paragraph is true, the headline should read &quot;Charter schools worse at educating students, data show'. I know you're quoting someone else in the headline, but their quote is incorrect and misleading. They are not &quot;no better&quot;, they are worse. And remember, charter schools don't have to accept everyone, don't have standard school bus service, and are hard to reach for low-income families. And they still can't perform better? Tue, Mar 13, 2012 : 6:31 p.m. It's actually impossible to tell if the difference reflected by the averages is greater or shows no difference without confidence intervals. It may not be statistically significant. And aside from that, there could be fairly large ecological effects; i.e. even if there is a significant difference, the schools might not actually be worse. For instance, if charter schools were disproportionately replacing public schools where students were performing poorly, you would expect to see the charter schools doing worse overall, even if they were doing better than the public schools in the area. Tue, Mar 13, 2012 : 5:53 p.m.
Tue, Mar 13, 2012 : 5:16 p.m. I would be more interested in a more in depth analysis. On average Southeastern Michigan schools are pretty average. But, if you look at DPS vs AAPS, there is a huge difference in scores. Most charters pull students from between 1 and 3 districts. I would like to see the school comparison by zip code. Also I would like to see first year schools excluded, since there is a known drop in scores when children transfer schools. Once that kind of analysis is done, we could actually have a real discussion. I would bet the findings would be in places like Detroit, the charters do better than the DPS schools and in places like Ann Arbor the charter don't match up. But I have not pulled the data and done this level of analysis, so it is pure speculation. Tue, Mar 13, 2012 : 11:20 p.m.
@Don &quot;Also I would like to see first year schools excluded, since there is a known drop in scores when children transfer schools.&quot; Just curious...In recent years, districts like Detroit and Flint and even suburban districts like Livonia have closed dozens of schools which result in student transfers to new schools within those districts. Would you expect those student's scores to be excluded for their first year in a new school or were you just referring to transfers to charter schools? Did the NEA infiltrate charter schools and ruin those, too? I think not. Perhaps the influence of parents and societal pressures have more effect upon education than what teachers can produce in the few hours per week they have with students.